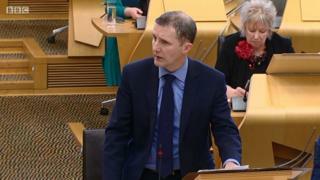 Scottish Labour has urged the first minister to investigate Justice Secretary Michael Matheson for alleged breaches of the ministerial code. The party claims he misled parliament over policing and unduly influenced the Scottish Police Authority (SPA). Daniel Johnson MSP has also raised concerns that Mr Matheson may have broken the law over his involvement in the future of the chief constable. The Scottish government said he acted "entirely appropriately" at all times. Mr Matheson is facing sustained pressure over his involvement when the SPA reversed a decision to allow Chief Constable Phil Gormley to return to work while misconduct investigations are being carried out. Mr Gormley, who denies the allegations against him, has been on special leave since September 2017 as the Police Investigations and Review Commissioner (Pirc) carries out its investigations. The SPA board unanimously agreed in November that the Police Scotland chief could return to duty - but when the then chair Andrew Flanagan informed the justice secretary of this, he said Mr Matheson told him it was a "bad decision". In a letter to Nicola Sturgeon, Mr Johnson, who is Labour's justice spokesman, said this could constitute an order - or "direction" - to the independent police watchdog, which he said was made without following the proper procedures. The justice secretary had previously made a statement to MSPs in which he insisted he had merely questioned the process the SPA had gone through when making the decision, asking whether the leadership team at Police Scotland had been informed along with those who had complained about Mr Gormley. Mr Johnson said that in his statement Mr Matheson claimed "this intervention was concerned with 'due process' rather than with influencing the 'outcomes' of the SPA's decision". He added that this stance was "not supported" by what Mr Flanagan later told MSPs on Holyrood's Public Audit Committee. The Labour MSP stated: "As such, the minister's characterisation of the meeting to Parliament was both inaccurate and knowingly misleading, in contravention of the (ministerial) code." He continued: "At committee, Mr Flanagan also revealed that there were in fact two meetings held with the minister on that date. Image caption Nicola Sturgeon has said her justice secretary's actions were "entirely appropriate"
"The minister's omission of the second meeting from his statement to Parliament paints only a partial picture of the nature of his intervention, again raising questions of accuracy." In his letter to Ms Sturgeon, the Labour MSP also argued: "The minister's action could also be construed as breach of section 5.3(b) of the Police and Fire Reform Act (Scotland) 2012. "This states that Scottish ministers should lay a copy of a direction given to the authority (SPA) before the Scottish Parliament. "This would also constitute a breach of section 1.2 of the ministerial code requiring ministers to comply with the law." The first minister has defended Mr Matheson in parliament, insisting his actions were "entirely appropriate". A Scottish government spokesman said: "The justice secretary has acted entirely appropriately at all times. He made clear to parliament he felt such clear deficiencies in the SPA board's decision-making process were completely unacceptable. "Mr Matheson asked that further engagement and consultation be undertaken, to which the former SPA chair agreed. As noted by the former chair, Mr Matheson did not direct the SPA board to reverse its decision. "The first minister has already made it clear to parliament that she supports the justice secretary's actions. We will respond to Mr Johnson's letter in due course."